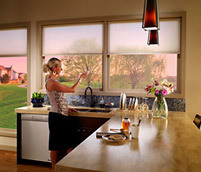 Cellular Shades represent an evolution in Lutron window treatment operation, as they are the first wire-free, battery-powered shading solution. HomeWorks QS has many new features including an updated Home Control+ app--which now includes level editing capability and can integrate with the new Sivoia QS Wireless Insulating Honeycomb Shades. Lutron is committed to providing top-notch service for each of its innovative products and systems. Explore the array of service options available to our customers, as well as an exhaustive collection of technical resources and materials. Gain the competitive edge that Lutron has enjoyed for more than 40 years through light control education and training. In this section, find industry primers, online tools, training seminars, and more. Eliminate glare and create the ultimate viewing experience in your media room with Serena shades. When you’re ready to watch a move simply close the shades using the remote from the comfort of your couch. Install shades in hard-to-reach windows for convenient control with the remote.